I'm a bit preoccupied and doing things mainly for distraction. Hopefully I can update in a few days with a clear mind. In the meantime here's something I am hoping to make today: Pumpkin Oatmeal Muffins. I'm not particularly domestic and don't usually spend a lot of time researching new recipes, making Pinterest boards, etc. But a couple of months ago I started making these muffins for Mr. Turtle to freeze for breakfast at work. And they are so yummy! I think they are fairly healthy too. Muffins are hit or miss for me but these are always fluffy, moist and full of flavour. I make double batches and help Mr. Turtle eat them. AJ also likes to have bites too. I haven't been able to find plain pumpkin puree so I use a can of pumpkin pie filling. Not as healthy I'm sure but it works. I skip the salt,spices and vanilla extract, but I do add the honey or maple syrup. I toss in a couple of tablespoons of flaxseed meal. Can't taste it but it makes it a bit healthier. Swimming pool that is, not billiards. jump into the water (parent always goes in first). The older children (the age range was 6 months to three years old) were able to jump in themselves; the younger babies were supported in some way by the parent. Back and front float (supported). AJ preferred the front float. There is something she likes to do on her tummy! Blowing bubbles (it took a few lessons for me to not be completely grossed out by this. I still am, a bit. Swim diapers don't absorb pee, ya know.) AJ didn't blow bubbles, but she did like to stick her tongue out and lap up the pool water. Probably that's the reason she liked the front float. Splashing. AJ eventually got comfortable enough to splash about. Face in the water / head in the water. This was in and out. I had to force myself to put AJ under at first, but she quite liked it. Dropping a plastic ring to the bottom and touching/retrieving it. This was more for the older children. AJ wasn't very interested in the ring. She would sometimes follow it with her eyes but when it went under water she'd look around for something more interesting. Singing songs and doing actions (this took up most of the 30 minute class). By the end of the lessons I knew most of the lyrics and I think I deserve a mom star. In some ways I feel like an intuitive parent, in others not. I'm not a natural when it comes to singing nursery songs. I like the clever ones, such as Raffi's songs (this goes through my head all the time. But don't look at the video images. It's much more entertaining if you just listen and picture it yourself.). But it's hard me me to get into "If You're Happy and You Know It" or "Hokey Pokey". I paste on an enthusiastic smile and sing but inside I'm thinking "This is really dumb." Oh well, I knew I'd have to make sacrifices as a parent. At least it's easier in a group. I am glad I signed up for pool lessons. 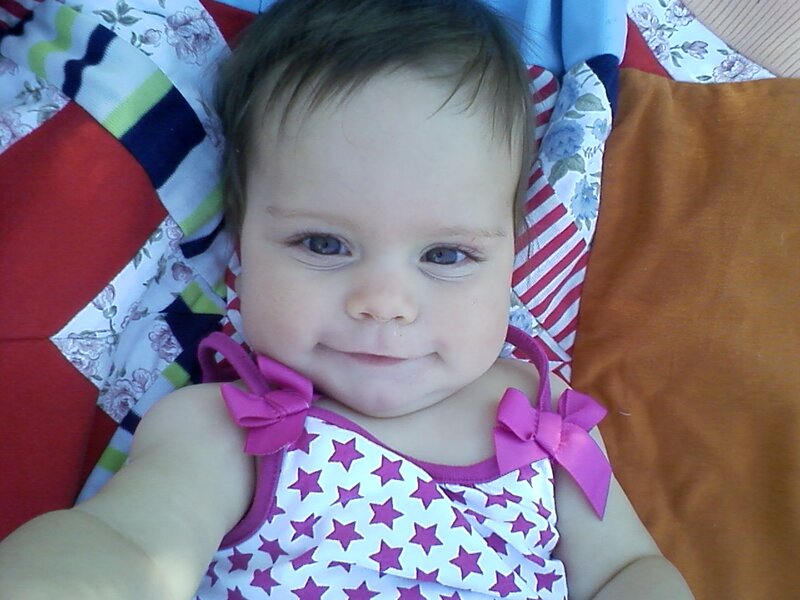 I had been thinking about it for a long time, but it sounded so complicated to me to take a baby to the pool. It wasn't actually that complicated however. In case anyone out there overthinks these things, like I do, here are my tips for taking baby to the swimming pool (solo). One sturdy tote bag for towels, wet swimsuits and water shoes. Mini diaper bag (backpack sling): change pad, regular and swim diapers, wipes, comb, baby's clothes, also mom's wallet, car keys, phone, etc. I used a baby carrier. 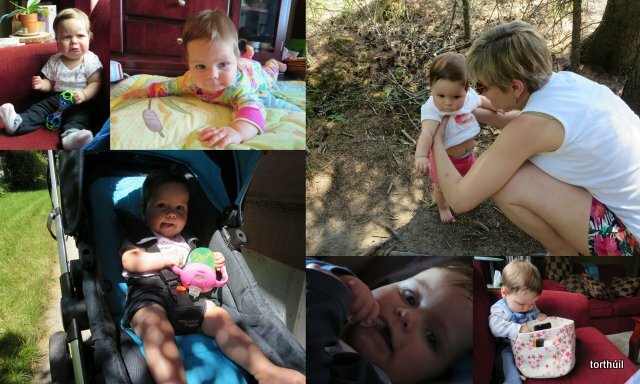 I found this easiest for me, but other parents used strollers or even car seats. I don't know what they did with those while they were in the pool. A stroller seems like more trouble than it's worth to me, and I would not be comfortable just leaving it somewhere. Wear slip-on shoes. I also wear pool shoes (Vibram Five Fingers) because it gives me that extra bit of safety. And I hate warts. Two piece swimsuit for mom. Easier to go to bathroom in. On that topic, go to bathroom before leaving for the pool. I always have to go when I get there anyway, however. Bring less stuff. On one hand it's sometimes a good idea to prepare for any eventuality with a baby. On the other hand you have to carry it around. For short trips I prefer to take the minimum. The first time we went, I packed a personal care kit with soap, shampoo, mini loofah, deodorant, lotion, etc etc. HAHAHA no. That kind of high maintenance was for the pre-baby days. If you really care about being clean it's much easier to have a real shower after you get home. Get a locker, preferably near a surface where you can change baby / leave baby within arms reach. If you have an ambulatory baby however, he or she is probably better off on the floor. Plan for nap time afterwards. AJ was always very tired after swimming. Pool time was really fun, and AJ even got her first report card afterwards. Woot, she passed! hahahaha. We will definitely be going back as a family. Before having my daughter, or at least at some uncertain but fairly recent time in my past, I was fascinated by family resemblances. I loved to look at photographs and pick out shared features. One thing I found quite entertaining at parent-teacher interviews was to observe the resemblances between children and parents, both in looks and in mannerisms. I think my favourite encounter of this sort was between an (occasionally challenging) parent and her (occasionally challenging) son. We were discussing some aspect of his behaviour and appropriate responses to it, and the mother commented with a bit of annoyance that no matter what she asked him, his response was always "Yeeeeaaaaah" (imagine it said through a resigned sigh). We went on with the conversation, and a couple of minutes later, she responds to one of my statements with "Yeeeeaaaaah" uttered in the exact same tone and manner as her son. Enter AJ. Many people love to look for and comment on her resemblances. I find it amusing how varied these are. In the space of a day I can hear "she looks just like mom!" and then "she looks just like dad!" or even how she resembles someone in extended family. They're all right in a way I suppose: she has our genetic material and by extension our family's, too. 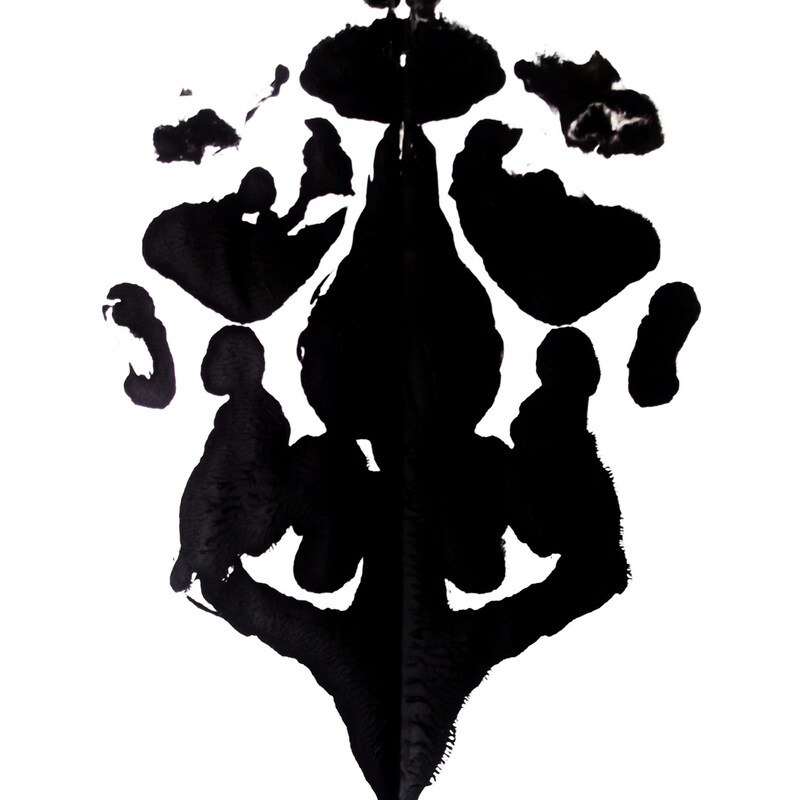 But sometimes I feel like AJ is a kind of Rorschach test and everybody sees what they are looking for. If she was conceived by donor egg, and we didn't tell people, would they all make the same comments with the same conviction? I think they would. I don't see resemblances to anyone. (Except when AJ yawns: then she looks like Mr. Turtle.) I'm not saying they aren't there; I just don't see them. I see AJ. Also, this may be indulging a privilege because I was lucky enough to have a genetically related child, but so far I don't care. I don't have the same desire to look for family resemblances in my daughter that I used to have with regards to other family members, students, friends and acquaintances. I'm not sure why this is. Perhaps it is just harder to see resemblances to myself because I don't look at myself all the time. A lot of my mannerisms are habit, and like the mom in my example above, I probably don't notice that I'm even doing them. I do think it is easier to see resemblances to Mr. Turtle than to myself, although even so I don't see them constantly. As for why I don't care, that's a bit harder. At least for now (because I may feel differently in the future) I think it has to do with a changed perception of what bonds a family together. Genetics are an obvious bond. However, after going through all the fertility tests which suggested I would probably not be able to have a genetically related child, I had to re-think what bonds a family together. Even though we were able to have a child, that experience still affects my perceptions. I feel like I crossed some invisible line, and things are just different on this side of the line. So when people comment that AJ is so much like me or Mr. Turtle or so and so, I smile and make an accommodating remark, but I'm not really playing the game. Because what matters most to me is that I have a child who is her own individual, and becomes more that unique individual every day. On days that I feel energetic and optimistic about how much I'll get done, I often write a to-do list. On days that I feel rather less so, for whatever reason, I like to write a "have done list." That means I start off the day with a blank sheet (whiteboard, in my case) and as I do things I write them down. The only things on the list are the things that are already done. It's actually a good system and helps me focus on what I do successfully and efficiently (or less efficiently) on a daily basis, instead of the big tasks that are still undone. More blogs - read them, comment, then add it to your have-done list! I call my phone the DumbPhone. Maybe this will change in the future, but whenever I have to replace my phone I always ask for the free model which is the simplest and least impressive of the lot. I don't like phones; I never have. I enjoy blogs and other social media to an extent because there is something territorial about them. I feel like I own the space that torthúil occupies, although that's probably an illusion. Phones on the other hand feel intrusive and outside my control. They ring obnoxiously and interrupt what I'm doing. I have to talk to people I can't see, which I've never liked. If there's any way to avoid phoning someone, I'll take it. There are a few people I that I truly do enjoy talking with on the phone: I can count them on the fingers of one hand. I bought my first cell phone in 2005 when I traveled to Europe for a year; altogether I've owned three phones in the past ten years, including the Dumbphone. The Dumbphone is a flip phone from 2011. It takes calls and makes calls and I have voicemail. I can receive and send texts (keyed in the old fashioned way because there is no keyboard. I don't like texting anymore than I like phones). It's scratched and battered and most recently, my water bottle spilled all over it. I took the battery out and dried it overnight, and lo, the Dumbphone recovered to ring another day. After the Dumbphone's crisis, however, I decided I should copy whatever media are on it. The Dumbphone has a camera that is about as impressive as its other features, but I have taken a few photos over the years. I actually was able to locate the cable that connects it to my computer, and managed to copy the pictures and one video. Among the photos were some that gave me unsettling deja vu. I rarely think much about these photos, or consider them of much value. But when I actually looked at them full size, I was surprised by the intense meaning some of them hold. I give you: Selections from the DumbPhone's gallery. I wish I could attribute this piece of art properly (if anyone does know the correct name or the artist's name, please let me know.) 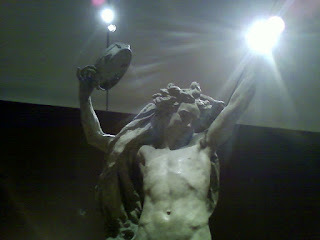 All I can tell you from memory is that it's a sculpture in the Detroit Institute of Art, and the name is something like Spirit of the Dance. A naked man dances with a tambourine (I wasn't able to fit all of him into the frame). He exudes joy and exalts the physical body. I took this photo on December 27th, 2011. Mr. Turtle and I were in Michigan visiting my in-laws. We had passed Christmas day and Boxing day (also my birthday) with my MIL and now we were spending a couple of days with my BIL in Detroit, where he had just bought a house. The visit to the Institute of Art was one of tourist activities we did. At that time Mr. Turtle and I had been TTC for about 4 months, and it was at the point where I was wondering "what else can we do to make this work." I forget if we had made any special efforts that particular month. I had purchased the Ova.cue fertility monitor and packed it, but hadn't used it yet. I hoped it would turn out to be waste of money. I really, really, really wanted to be pregnant that Christmas. Probably because of the sentimentality of the holidays, and because we'd been married a year and a half, and because we'd been trying for a few months and dammit, it was time. And probably because of an uneasy feeling that if I wasn't pregnant soon, it might mean something was wrong. I'd been charting and based on my charts so far, the Period was a couple of days late. I woke up full of optimism on the morning of the 27th - and there was the Period. That day was the first time I was very disappointed that I wasn't pregnant. And on top of that it was an awful period. I felt like a deflated balloon, except I didn't because I was so bloated. All day I was in pain with the cramps. Despite that, I did enjoy the Institute of Art. It gave me plenty to focus on outside of myself, so while I was still unhappy and uncomfortable, I was at least distracted. What I couldn't do was be social. Most of the time I left the rest of the family behind and wandered in the galleries on my own. I didn't want to stand still for any reason. In those wanderings I found the Spirit of the Dance and immediately related to him. I love dancing and tambourines, so he embodies physical ecstasy for me. Although I remember this day so vividly, from the plaid shirt and jeans I was wearing to the heavy disappointment in my core, the image transcends all of it. And until a few months ago, he was the background image of the DumbPhone. Every time I looked at it I saw the Spirit of the Dance. You're probably wondering: what the heck is that?! The last week of January 2014 our house was burgled. This happened after a very stressful and emotional couple of weeks where our IVF cycle was cancelled and we were told that further fresh IVF treatments were pointless. I walked into the house after work and found it a mess and most of our valuables gone. Even worse than the loss of our possessions was the sense of invasion. I don't think much about the thefts anymore but the fear of a stranger coming into my space and threatening me still comes back from time to time. Pictured above is what was our music room. I'm not sure when I took this photo, but I think a couple of days after the burglary. 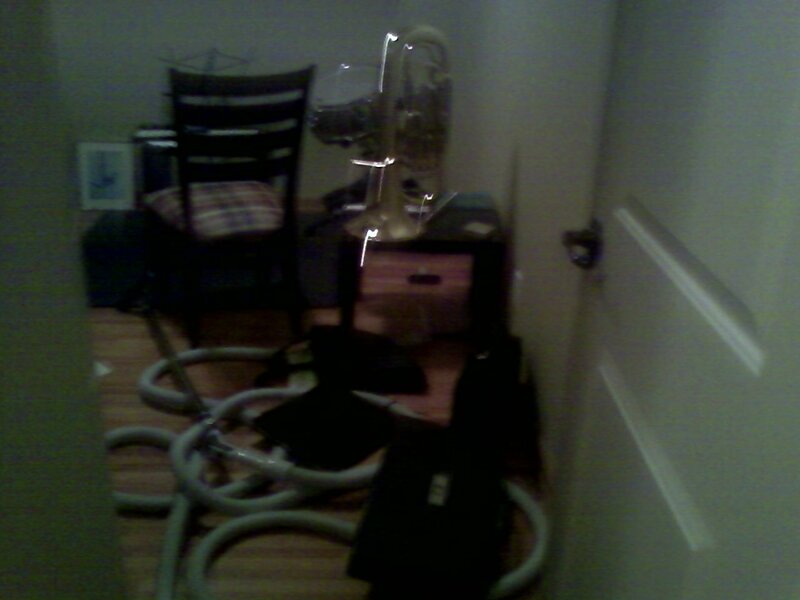 In the background is a music stand, a chair, my snare drum, and my euphonium on a small table. In the foreground the vacuum cleaner hose and a couple of instrument cases, I think. None of our musical instruments were stolen, although they were the single most valuable items in the house: too large and difficult to turn into cash, I imagine. However, my euphonium was in a backpack case and that was stolen; I assume to carry away the rest of the stolen goods. There was one thing I found odd. Everywhere else in the house, items were knocked over, thrown about, broken. The one exception was here: after taking it out of the case, someone placed my euphonium carefully on a table, much like it is above. In contrast with everything else, this gesture seemed out of place, almost respectful. When the policeman came to do the report with us, he dismissed the burglars as the "scum of the earth." Almost everything I know and feel inclines me to agree, but because of this gesture at least one of them seems more human. If anything that makes the whole event more disturbing. 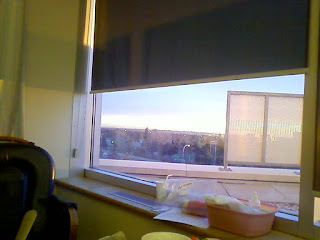 I took this photo from my hospital bed a few hours after AJ was born. One of my birth fantasies was to have a picture of the sunrise on the day she was born. However, the photo didn't look very impressive on my phone screen so I never did anything else with it. Yet when I look at it I feel much that takes me back to that moment. I remember feeling like there was so much to do and learn after she was born: I was exhausted but who had time for that? I was served breakfast at about 6:30am and didn't believe I actually wanted to eat, but I did. I remember thinking I would never have time to sleep again, although I did - eventually. This photo has other little details that I didn't even think of capturing at the time. The glider barely visible on the left was where Mr. Turtle sat most of the time and cuddled with AJ. The papers sitting on the window ledge are the birth registration documents. On one of these we later wrote AJ's name - but when this photo was taken she was not yet named. The ziplock bag has the warm socks I brought for labour but never used. The cup probably has ice water that was partly drunk and set aside. Probably the most significant object for me is the pink plastic bin on the ledge. This has the breast shields and tubing that were meant for the mechanical breast pump. When AJ had one low blood sugar reading, the medical staff immediately recommended formula supplementation and the nurses brought in the breast pump in case I had to pump. But the pump was never used. AJ learned to nurse effectively, her blood sugar readings never fell again, and I was filled with confidence that I could indeed feed and care for this tiny newborn life. So there you go. Three ghosts from the past, thanks to the fact I didn't have a decent camera at the time. They aren't even good photos. Yet if the purpose of a picture is to capture a memory, these do it better than many prettier ones. I'll be keeping them. And this is the DumbPhone's current background image.